Five people were missing after a 9 a.m. explosion at an Oklahoma drilling rig Monday morning. Five people are missing after an explosion at an Oklahoma drilling rig Monday morning. The explosion occurred at 9 a.m. Central time in northeast Pittsburg County, according to the Pittsburg County Sheriff’s Office. County officials were not immediately available to comment, but Kevin Enloe, the county’s emergency management director, said five people remain unaccounted for. Officials did not say whether anyone was killed or how many, if any, were injured, but Enloe said at least three medical helicopters had landed at the site. Pittsburg County Sheriff Chris Morris said more than 20 employees were present when the explosion happened. The sheriff’s office also said a nitrous truck will be used to help suppress the fire. The explosion sent black smoke to nearby farmlands. The drilling rig is operated by Oklahoma City-based Red Mountain Operating, said Matt Skinner, spokesman for the Oklahoma Corporation Commission, the state agency that regulates oil and gas industries. A call to the company was not immediately returned. The explosion occurred using a rig provided by Patterson-UTI Energy Inc., Enloe said. Patterson-UTI, a contract driller, confirmed in a statement that some of its employees were missing after the fire. The company said it was cooperating with first responders and authorities on the scene. 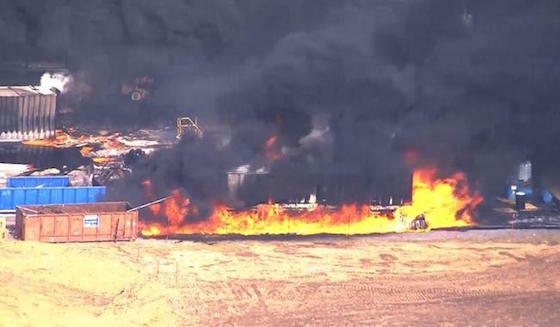 This is the second fire at an Oklahoma oil and gas well site in less than a year. A gas explosion occurred at a Trinity Resources well in the same area in February 2017, injuring a worker. The cause of the explosion is not yet known. Skinner said the Occupational Safety and Health Administration (OSHA) will investigate the cause. “Once things are under control, we oversee remediation of any pollution,” Skinner said. A call to OSHA’s Oklahoma office was not answered Monday because of the partial federal shutdown. Skinner said he’s not aware of any violations involving Red Mountain Operating. He said he’s not sure whether the company was drilling oil or gas, but some media reports described the incident as a gas well explosion.